Saddle stitched magazines or catalogs are folded sheets gathered together and stapled along the folded crease. 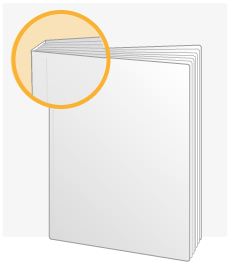 Staples printing is a popular technique similar to loop stitching which is optional available if saddle stitch is selected. It is very cost effective and popular for a page count between 8 and 48 pages, but depending on paper thickness up to 132 pages can be selected. 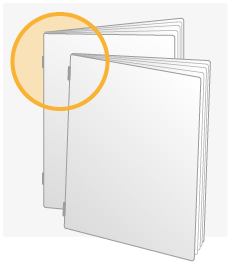 Usually a faster turnaround is possible in comparison to perfect binding. Perfect binding or glue binding is the right choice for magazines with more pages. Again page count and paper thickness affects the possibilities. E.g. a 100 lb Cover / 12 pt art print magazine with 28 pages is already suited for perfect binding. The advantage of perfect bound magazines is the durability, and the higher page count possible, as you can select up to 360 pages. The page count and bindery will affect the file preparation of your printing project. Here you can find useful information for a high quality result. Over the past years, it became a real new alternative to entrust an online printer with your catalog, booklet or magazine printing. Printing magazines online with Printsafari means being sure to receive high-quality offset printing with the best finishes at very competitive price. As the saying goes, time is money! Ordering qualitative products, without problems, with fast production time, this is what Printsafari can guarantee with its complete machinery. The management and the transmission of your print-ready files will also running smoothly with us. This is how we propose you to save money. Whether for companies with regular printing needs or whether for those with more punctual but more important needs, printsafari will become your online printer to get a magazine printed. Print your catalogs or magazines with Printsafari for your business communication, lists and product catalogs, for user instructions but also for your weekly, monthly or any other kind of newspapers and reviews, for your trade fair and exhibition pamphlets ensure you receive the best products at attractive and competitive prices in without delays. The range of sizes is as vast as the one for papers. For example, print your magazines from 8.5x11 to 6x4 without forgetting special sizes like square ones. Beside common magazine sizes measured in inch you can order european sizes like din a4 magazines. As far as papers are concerned, go for a glossy paper to enhance your pictures or for a matt to have a classic, neutral appearance for your magazine. You can also play with the paper’s thickness to reinforce the aspect your cover will have. The addition of a lamination or a coating - selective or not - could also be a differentiating factor. And finally for the binding, trust the traditional way and select an perfect or stapled binding. In other words, Printsafari offers you the possibility of printing all your magazines online, no matter the paper or the size, from 8 to 360 pages. Self publishing a magazine can't be easier. But whatever the use of your magazines, product catalogs, reviews, newspaper or varied booklets is, we know they are permanently needed and therefore we will not let you down.